The Glenmorangie Company was the toast of the prestigious International Wine & Spirit Competition (IWSC) this week after picking up the best UK Spirits Producer award, fighting off stiff competition from vodka, gin, rum and other whisky producers. Glenmorangie has won a remarkable total of 18 ‘Gold Best in Class’ medals over the past five years at the IWSC – the most internationally-recognised awards body. This is more than any other single malt Scotch whisky, making Glenmorangie the ‘best awarded’ of any single malt. 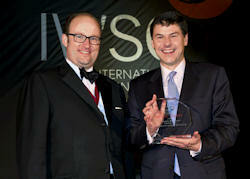 Since its foundation in 1969 the IWSC and its panel of judges have rewarded excellence in the world of wines and spirits. London’s historic Guildhall played host to Wednesday night’s banquet which drew 500 aficionados from across the globe. David Kelly, IWSC marketing manager, said: "2011 has been a record year for the Competition, with an increase of whisky entries by 21 per cent. The quality of products entered has been particularly high, and it is no surprise that Glenmorangie has won this award." The follows Glenmorangie’s win at this year’s Wine Enthusiast Wine Star Awards in the Distiller of the Year category, beating an impressive list of nominees.